Are You There Linus? It’s Me, Charlie. 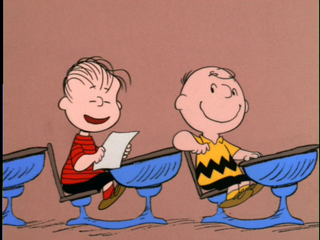 Last week when I was writing the piece called Happiness, you know the one where I promised to stop blogging forever, I went to YouTube to watch videos of grade school and high school kids in productions of You’re A Good Man, Charlie Brown. Because it was my happiest moment, I thought I might learn something from watching videos of another generation poring their hearts and souls into Happiness the same way my 4th and 5th grade co-stars did. I don’t know that I learned anything, per se. Kids are kids and dramatic kids are dramatic kids. Also no surprise, dramatic kids often grow into dramatic adults. Yesterday, during my swim, I thought about where life took my friends who shared the stage with me on that hallowed Kansas elementary school production. I am only in contact with two people, one of the Lucy’s and one of the Patty’s. I’m not too sure whatever became of the other Lucy or the other Patty. Snoopy moved away in 6th grade. And I don’t even remember who played Schroeder. (No small parts, you say? Tell that to the person who plays Schroeder.) I do remember, and I’m still sure of this to this day, we were all stars in the making, Broadway ready. As if on the day of the last performance, we could have piled into Mrs. Tideman’s Buick Sportwagon, driven cross country and arrived in New York, ready to take it by storm. We were THAT good, we were Spring Awakening good. If I overplayed every scene, my Linus, another 5th grader named Derek, deftly underplayed each of his. The tallest and smartest boy in our class, his Linus was nuanced and intelligent and thought-provoking. And the juxtaposition of 6 foot ten year old, holding a blanket and sucking his thumb, made for a pretty funny sight gag, too. As it turns out, my Linus, Derek Schmidt, is now the attorney general of the state of Kansas. In the last few months of 2014, Derek’s face and words were all over the gay press because of his role in Kansas’ battle to avoid marriage equality. In a google search I did today, I found this quote from the San Diego Gay and Lesbian News, “Gov. Sam Brownback, the right-wing, homophobic Republican, and his equally anti-gay Attorney General Derek Schmidt, are trying their best to fight the order of the court.” And I know the gays tend to make sweeping generalizations, but I had to pause and ask myself, Carrie Bradshaw style, IS Derek Schmidt as equally anti-gay as Brownback? It’s something I ponder. Yes, his role in this war is clear. He has been awarded the task of being the face and voice against marriage equality in his state. But everything I read that he says, he chooses his words so carefully, one still might wonder what Derek Schmidt truly feels about the rights of homosexual men and women. I wonder, if Derek was the attorney general for the state of Massachusetts, would he imbed himself in the fight FOR marriage equality? I have seen Derek exactly 2 times in the last 10 years. I saw him the weekend of my 20 year class reunion and actually spent time in his home with a small group and he and his wife were gracious and charismatic hosts. Two years ago, he spoke at the William Inge Festival, and we chatted briefly afterward. He offered his condolences on the death of my father and I thanked him and told him my father was still among the living. If he felt discomfort about being in a room that was comprised of, by Kansas standards, an inordinately high percentage of homosexuals, he gave no indication. Derek has always had an simple, aw shucks, intelligence and graciousness about him. He had it at 10, when he was playing Linus. I don’t know that Derek and I will have a real conversation about what he truly believes in his heart concerning the rights of homosexuals ever in our lifetimes. I am sure he would be guarded, choose his words carefully, wonder about my intentions. He is no longer Linus, I am no longer Charlie Brown. I have a hope that eventually the tide will turn in my home state. I get emails from friends in Kansas who are ardently in favor of marriage equality. The last ten years have shown much progress nationally and I don’t doubt the next ten years will show even more of a shift. As Schultz reminded us when he created the characters of Charlie Brown and Linus and Snoopy and Lucy and Sally and Peppermint Patty and the rest, we all have our vulnerabilites. If you’ve read even one paragraph of my blog, you’re probably well aware of mine. But I always thought there was something weak about Linus and well, I think the same about Attorney General Schmidt too. This is conjecture. But I don’t think Derek wants to be the face againt marriage equality in Kansas, he just wants to be the face of Kansas. He sees this as his opportunity to advance his political career. It’s not about people, it’s about his career. But for the rest of us, it is about people and I really want the gay people that live in my home state, a state I love, to have the same rights I have in California, even the same rights Mr. and Mrs. Schmidt have as a heterosexual couple living in Kansas. Somewhere in Kansas, as I type this, there is at least one (probably more) highly emotive grade or junior high schooler belting his heart out to Happiness in preparation for a school production of my favorite musical. He will grow up in that state and at some point come out of the closet, not that it will be a surprise to anyone. He will hopefully fall in love and maybe decide to live out his life with his husband in Lawrence or Wichita or Dodge City or Independence. And this is my hope: that his best friend Linus from that long ago production of You’re a Good Man, Charlie Brown will be there beside him at that marriage ceremony, that wedding, his best man standing up for his best friend. That’s my wish. And, good grief, I think it’s a sweet one. Oh I hope Derek gets a chance to read this and respond. If he does respond, I hope he does so from his official government email address. — “that his best friend Linus from that long ago production of You’re a Good Man, Charlie Brown will be there beside him at that marriage ceremony, that wedding, his best man standing up for his best friend. That’s my wish. And, good grief, I think it’s a sweet one. And now I’m in tears. How’s that for a “highly emotive” adult man… 🙂 Thanks for sharing this! Well, hey, who doesn’t love a good cry from time to time?